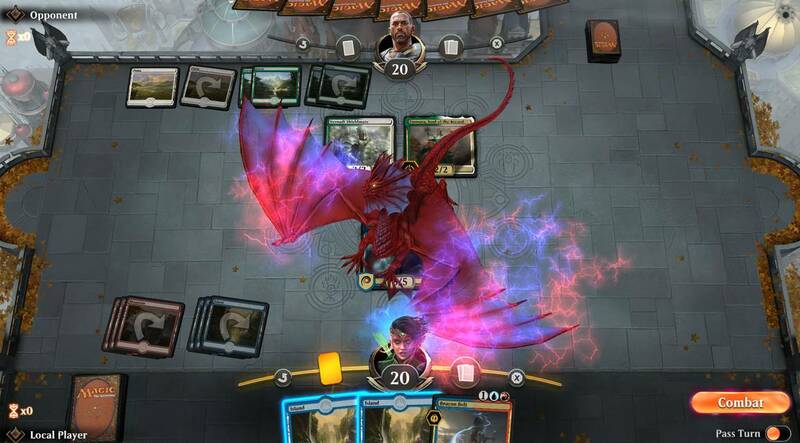 Magic:The Gathering Arena is a free to play online digital card game that offers the same cards, authenticity and fun that the table top version does. With only one game mode available in the open beta, 1v1 matches are still good fun as finding matches are quick due to plenty of players. 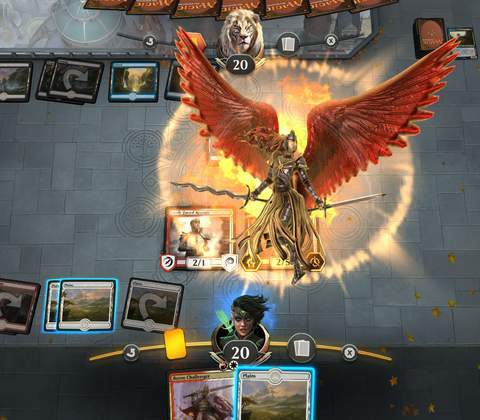 Progression is a key feature as players play more to unlock new cards and decks for deck-building, which is a staple of Magic:The Gathering. While it doesn't offer anything extra to stand out from other online card games, Magic is arguably the card game that started the genre, and in that regard it doesn't need to be unique or special other than to give players an authentic game experience to supplement the physical version, which it does. Authentic Magic: The Gathering game that uses real cards, rules and features from the tabletop version. Only one game mode available right now in open beta. Large player-base due to the franchise's popularity. Free to play with optional cash shop. The UI is a clean look and that's appreciated for navigation. Magic: The Gathering Arena is a letter of love to tabletop MTG players. Currently in open beta, the game is an online, digital reconstruction of the popular trading card game played around the world. It's free to play so it is accessible to everyone. 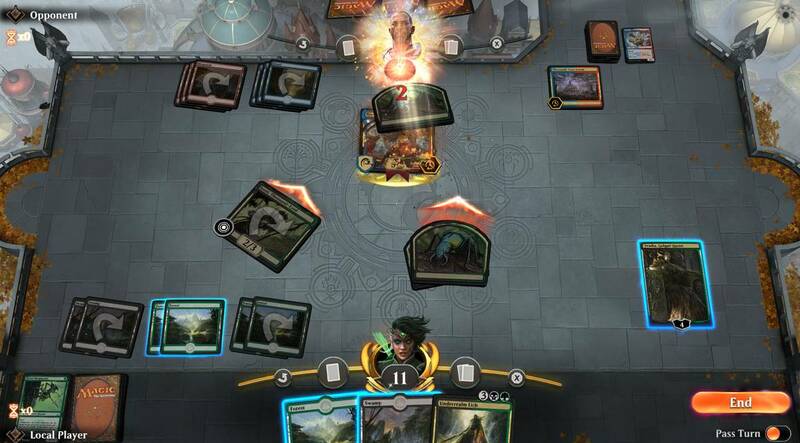 If you have played Magic: The Gathering in the past, then the rules and gameplay will be very familiar to you. Two players will go against each other using their chosen decks. Card decks contain up to sixty different cards. Decks and cards are categorized by color archetype. Red colored decks and cards are considered Aggro for example, for their aggressive style of play. Blue on the other hand, is for control, which allows you to manipulate the ebb and flow of a match. This digital online version of MTG stays true to that core Magic experience which is great for authenticity. 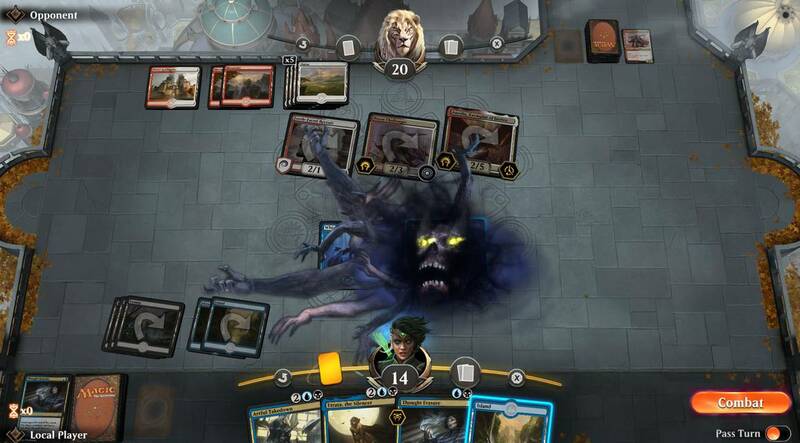 Gameplay is authentic MTG, but the added card animations and thematic environment makes it engaging. The first thing you'll be doing is getting through the tutorial consisting of beating several AI opponents with a starter deck. It teaches you the basics of placing land to power up your creature cards that you've summoned the previous turn, in addition to other rules, card strategy and more that happens during regular match. The objective of every match is to reduce the opponent's health to zero. Once out of the intro tutorial, players can now take part in PvP against real players and that's where the fun is at. While there's only one PvP game mode available right now in the open beta, it's still good fun. 1v1 matches pop very quickly as the player population is high. In matches against real players, the dynamics changes somewhat since that's a real player on the other side, and matches can become incredibly tense, strategic and most importantly, engrossing which is important for a card game. There's also a timer that counts down when a player's turn begins, to ensure that decisions are made within an acceptable time frame before the turn is forfeit if no action is being taken. This however has proven annoying on occasion, as some players go AFK once they've realized that victory is beyond them and they don't want to outright quit the game. So there's definitely room for improvement there. 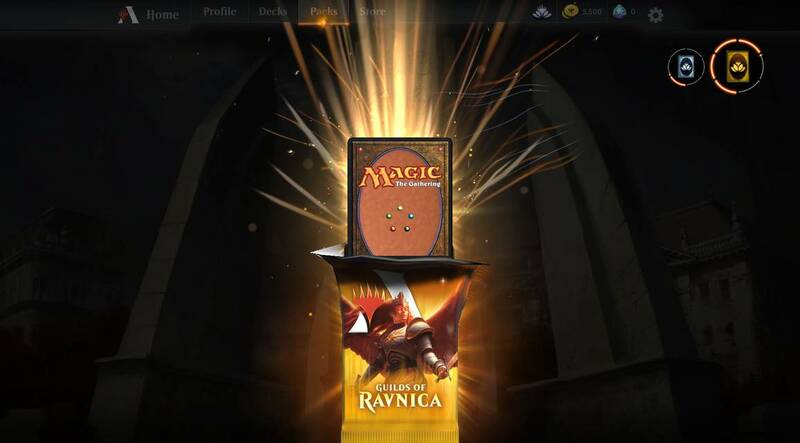 The one disappointment however is that the game doesn't offer anything new to Magic fans, like perhaps the introduction of a single player story campaign for example, that would have given fans of the franchise a real reason to play Arena besides the fact that it's just MTG Online. The real fun factor for a lot of Magic fans happens outside of matches, in the form of deck-building. 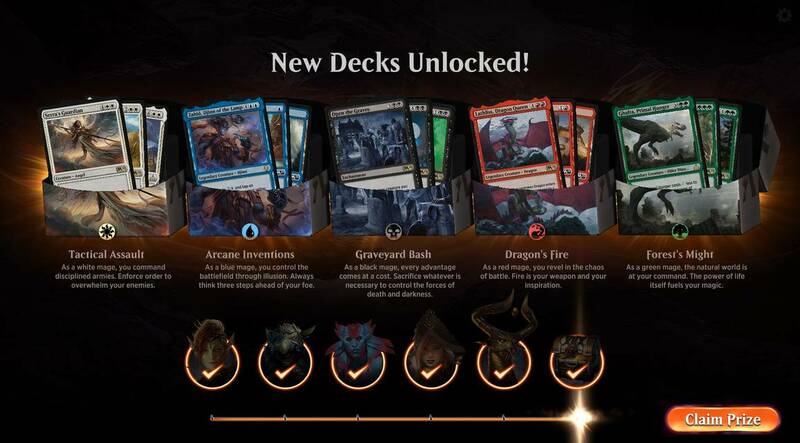 Magic: The Gathering Arena knows this and has added in a comprehensive UI system to make the deck building process more enjoyable. It's also an important progression system for players. Playing matches and completing quests, like win 5 matches today, will award players with new cards and decks based on real physical sets in the Magic universe. These can then be added into existing decks. 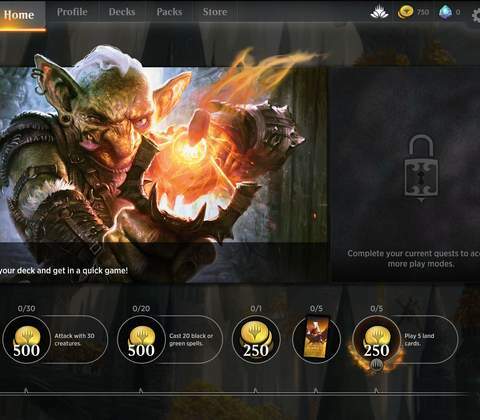 On the main menu, players can build, shuffle and edit their owned cards into custom decks if they wish to, and save them in the many slots available. This is a core feature for most card games and it's great to see it on here too. Ranks are another form of progression that unlocks new content and match modes, but this feature isn't as fleshed out yet because it's still in the beta. Ranks are earned from playing and winning matches, but oddly enough it doesn't show up on the player's profile page. Therefore, it's hard to tell what rank you are until you get the notification that you've made the next rank. While it seems a little light on the progression side of things, the game does offer plenty for players to do. There's a good amount of daily and weekly quests, challenges and matches to chew through. 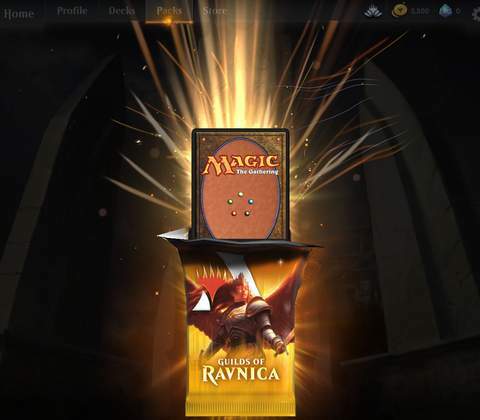 The one disappointment however is that the game doesn't offer anything new to Magic fans, like perhaps the introduction of a single player story campaign for example, that would have given fans of the franchise a real reason to play Arena besides the fact that it's just MTG Online. Card booster packs can be bought for in-game Gold and the pack opening experience is fun. 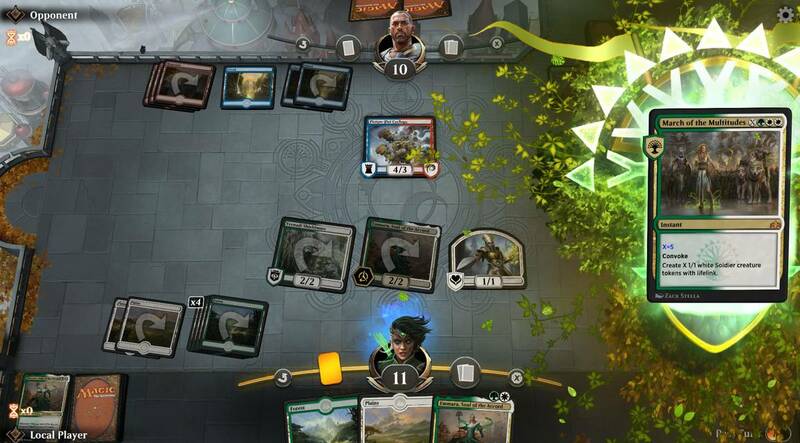 As with other online and digital card games, Magic: The Gathering does have an in-game cash store. 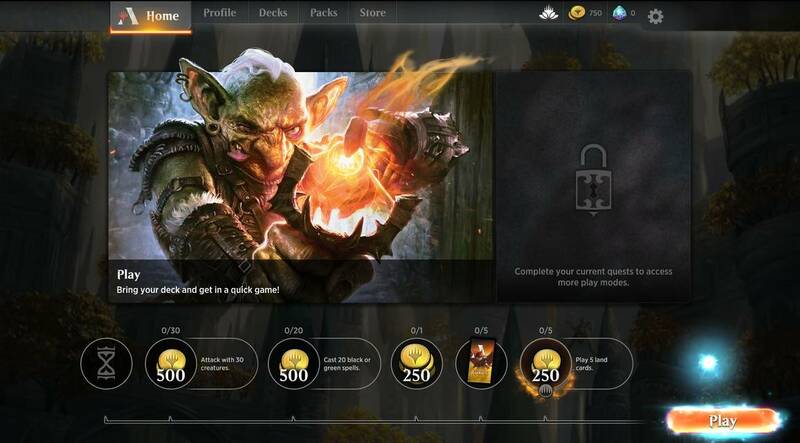 In it, players can purchase new decks and cards. 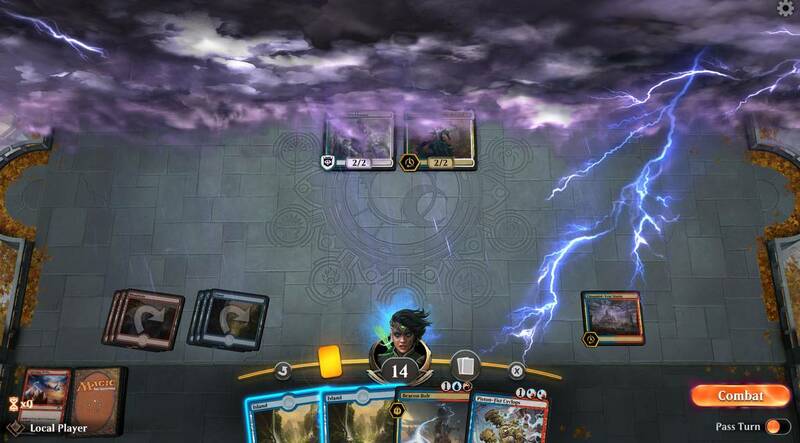 However, there's a lack of XP boosters or other items that speeds up any sort of progression, because MTG Arena isn't that sort of game. Players will earn Gold from playing matches and completing daily and weekly quests. Gold is an important in-game currency as you can use it to buy most things in the shop like card packs. There's also a premium currency called Gems which costs real money, but you can pretty much earn most of what Gems can be used to buy, when you simply play the game. One thing to love about Magic: The Gathering Arena is that all the card art is exactly the same authentic designs found on the physical version. The difference is, it's rendered to be view able in higher graphics and on larger monitors that helps players enjoy the art a lot more. Hovering over each card enlarges it, which is nice and provides easy reading as well. 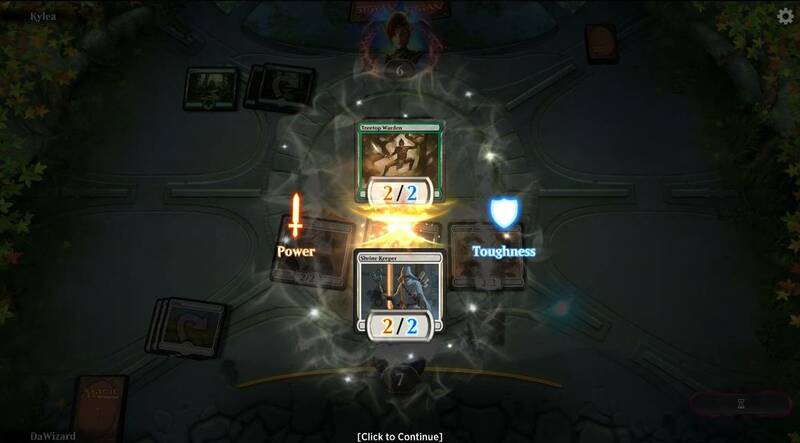 The graphics otherwise is pretty standard but common for online card games. Matches usually take place in living environmental back-drops that are thematic to the fantasy world of Magic. 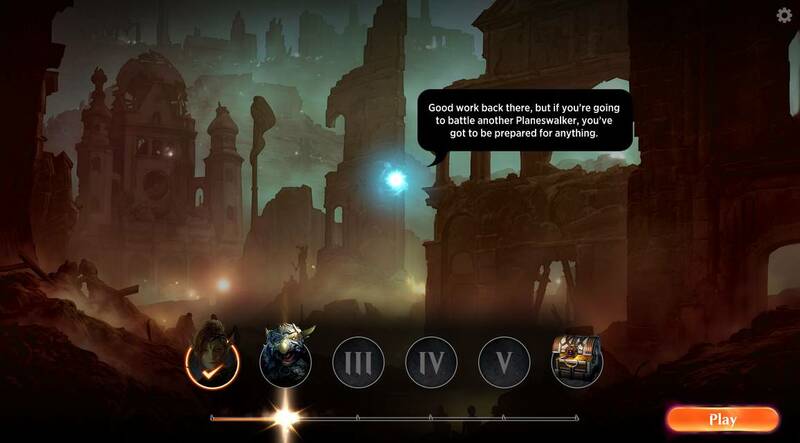 While the simplicity is appreciated, it's also a missed opportunity to stand out from competitors like GWENT, Elder Scrolls Legends and Hearthstone. 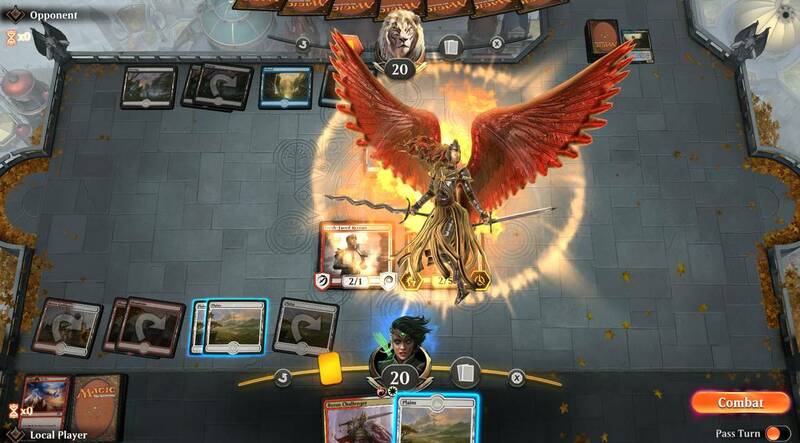 Overall, Magic: The Gathering Arena is a solid online card game that stays true to its classic physical roots. 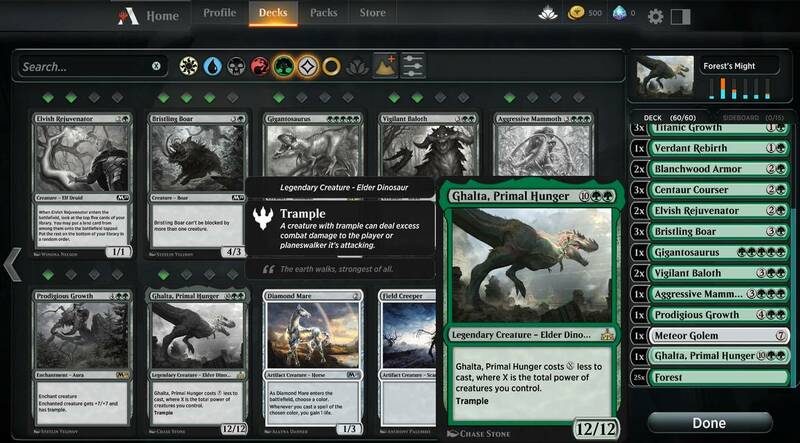 Thousands of players play Magic around the world, and it's good to see an online version that captures that same core gameplay essence with simple features and with a free to play model that doesn't punish players for not paying. Progression as with other card games comes over time as you hunt better cards to improve your decks, and if that sounds like fun to you, then the game is recommended. 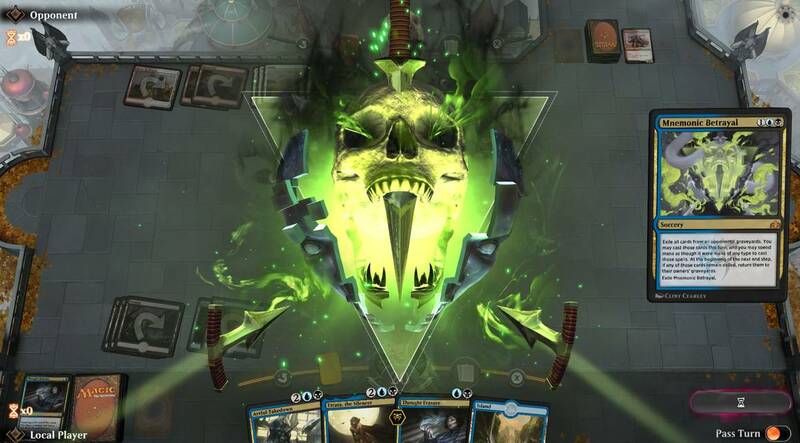 For other online card game players, Magic: The Gathering unfortunately doesn't do quite enough compared to other games when it comes to game modes offered. 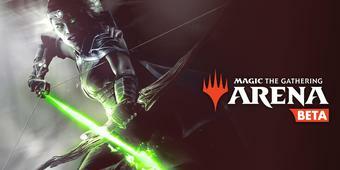 Ready to enter the world of Magic: The Gathering Arena? Click here to play now! Many will argue that Magic:The Gathering is the pioneer of table-top card games, and in Arena, the gameplay shows that off majestically. Pity that it took Wizards so long to create a digital version.